A group of 4 individual unit private Pool villas, consists of 2 unit 3 bedrooms pool villas and 2 unit 2 bedrooms pool villas which you can rent as individual villa, combination or the whole villas can sleeps up to 19 guests. 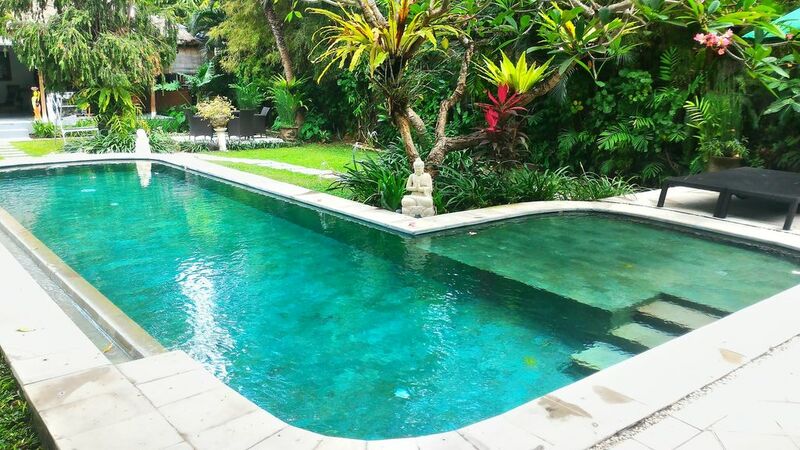 These Villas located side by side and next to each other in central Seminyak and each with private entrance gate. Different style with large tropical garden, the main building has two levels consisting the three bedrooms, spacious living and dining area, fully equipped kitchen and entertainment area. The 1st and 2nd bedroom is located in ground level. The 1st bedroom is air-conditioned, furnished with king-sized bed and en-suite bathroom. The 2nd air-conditioned bedroom offering twin beds and access to the main en-suite bathroom which have a shell-shaped bathtub whilst the 3rd bedroom is located in the second level, furnished with air-conditioning, queen-sized bed and en-suite bathroom. - 3 air-conditioned bedrooms with King, queen, and twins size beds. - Accommodating up to 6 adults and 2 children. - 3 indoor-outdoor bathrooms (one with bath-tub). - Spacious living room furnished with comfy sofa. - Fully-equipped kitchen with marble bench tops. - Entertainment area featured flat screen TV with satellite channels, DVD player and stereo system. - L-shaped swimming pool (10 x 4m) with sun loungers and umbrella. - Beautiful tropical garden with relaxing bale (gazebo) located near the pool. - Free mineral drinking water during the stay. - Free local phone calls. - 2 safety deposit boxes (one downstairs and one upstairs). - 1 house maid, 1 pool and ground maintenance and over-night security guard. Consists of two bedrooms that overlook the pool and garden. All have comfy beds, air-conditioner, white clean ceramic floor, bed-side tables with lamps, wardrobe with table, chair and dressing mirror. The en-suite bathrooms have a rain shower with cold &amp; hot water running, bath-tub and wash basin with mirror. - 2 air-conditioned bedrooms with king-sized beds. - En-suite bathrooms with hot &amp; cold rain shower, bath-tub, wash basin and dressing mirror. - Sleeps up to 4 adults and 2 children. - Dining area with 6 seating table(URL HIDDEN)meters swimming pool with pool deck and sun loungers. - 1 villa supervisor and 2 house maids. Consists of three bedrooms. The 1st and 2nd bedrooms are positioned side by side overlook the pool whilst on the other side is a pavilion that housing the 3rd bedroom. All bedrooms have comfy beds, air-conditioner, white clean ceramic floor, bed-side tables with lamps, wardrobe with table, chair and dressing mirror. The en-suite bathrooms of Villa #3 have a rain shower with cold &amp; hot water running, bath-tub, wash basin with dressing mirror. No bath-tub at 3rd bedroom (guest cottage). - 3 air-conditioned bedrooms with king-sized beds. Note: This villa is located about 30 meter away from the other villas. One of the bedroom in this villa will be locked. Consists of 2 bedrooms. The 1st bedroom is located in the ground level, furnished with air-conditioning, queen-sized bed, white clean ceramic floor, bedside tables with lamps, wooden cabinet, table with chair and dressing mirror. The bathroom have bath-tub with hot &amp; cold water shower, wash basin and wooden-framed dressing mirror. The 2nd bedroom is in upstairs, offering king-sized bed, air-conditioning, white clean ceramic floor, bedside tables with lamps, wooden table with chair and dressing mirror. The bathroom have rain shower with hot &amp; cold water running, wash basin with wooden-framed dressing mirror. - 2 air-conditioned bedrooms situated in the first and second floor, both offering a queen-sized bed. - En-suite bathrooms with bath-tub at 1st bathroom, hot &amp; cold rain shower, wash basin and dressing mirror. - Open-plan living room offering comfortable sofa, flat screen TV with satellite channels and DVD player. - Daily in villa breakfast at grocery cost. - Baby sitter, baby cot, toddler and high chair. - Car rental with English speaking driver. Villa #1 (Mr. Made and Mrs. Ayuk). Villas #2, #3 &amp; #4 (Mrs. Putu, Mrs. Ayu, Mr. Komang and Mr. Ketut). They are friendly staff and they will do everything they can to ensure your stay is enjoyable, safe and stress-free.